A humble fruit that is delicious. A humble fruit that look beautiful. A humble fruit that fills your tummy. A humble fruit that cures your body from constipation. A humble fruit that is available throughout the year. The humble fruit that most of you love. Incorporating banana's or rather replacing eggs with bananas in baking is a boon I say. It adds taste, aroma and incredibly tempting flavor. I had a dozen of super ripen bananas at home and couldnt stop day dreaming about banana bread. Hence shook off my laziness and whipped up the batter within 10 mins. Put it in the oven and sat with satisfaction. It was 10 mins up and the kitchen was already smelling heavily of banana.. Ummmmmm.. thats when disaster struck in the form of power cut. Oh the dare devil against baking was there. :( Waited patiently for the next 1 hour until it came back and with so much of prayers I switch the oven on again. My prayers got answered and was blessed to get a pretty soft, dense, delicious banana bread out of the oven. Recipe inspired from my buddy blogger Jeyashri - here. Sieve maida, wheat flour and cooking soda together and keep it aside. Chop bananas into small pieces and grind it along with sugar and milk into a smooth paste. Now take the ground mixture in a large mixing bowl. Add oil, vanilla essence and curd to it and mix well. Finally fold in the sifted flour mixture into it. Chop the walnuts and mix them into the batter. Grease a bread tin with butter and dust all purpose flour evenly. Pour in the batter into the bread tin and bake at 180°C for 40-50 mins. Remove from oven and allow the bread to cool on wire rack for a while before cutting out slices. 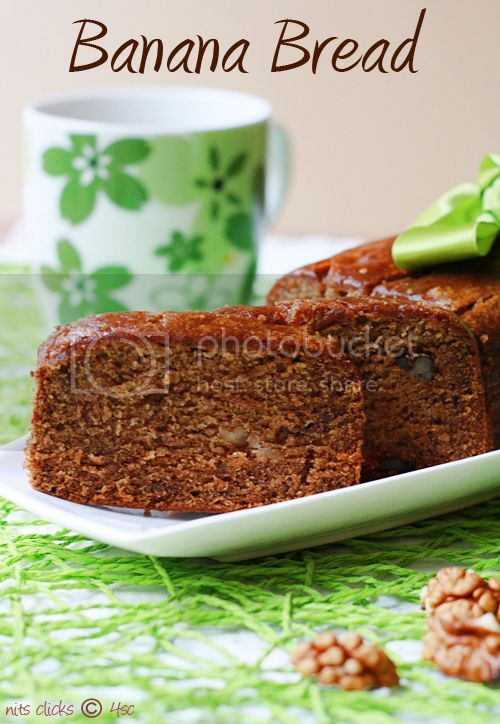 Fabulous...Lovely combination of banana and walnut..yumm. now i am not a big fan of banana but that bread just looks fantastic! photos were amazing again u did nt disappoint us with the combination..
" A humble fruit that has more calorie"
Banana in baking never fails. Looks supermoist and soft. perfect clicks too. 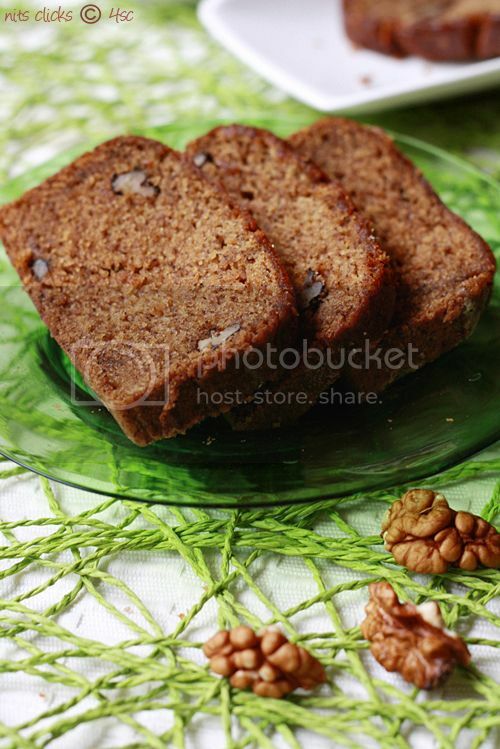 Love both banana and walnut, bread looks super moist and delicious! 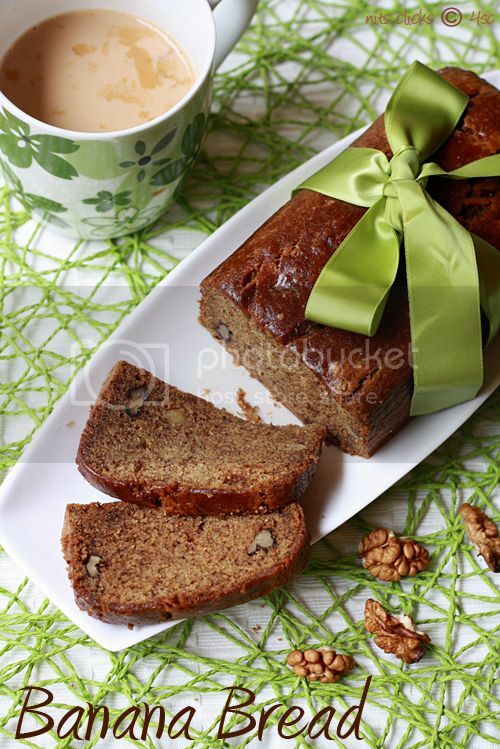 Banana Bread looks very nice.. Beautiful clicks!!! Lovely combo...bread looks fantastic. Nice clicks. 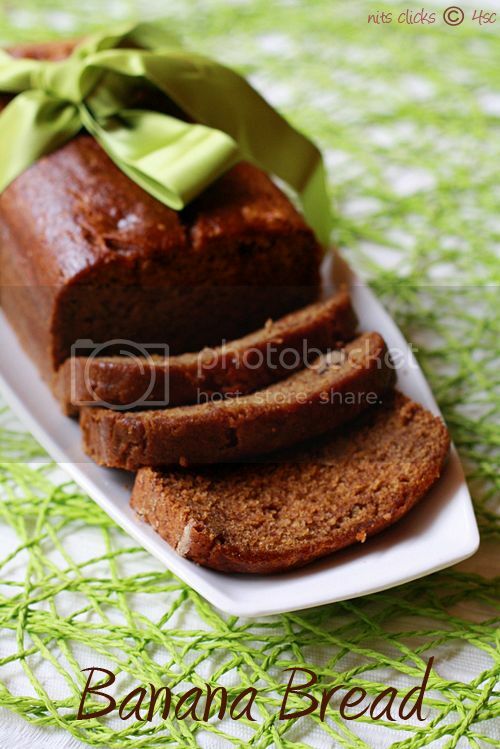 Super looking banana bread...Delicious..Love this combo..
How did you get the dark brown glaze on top? Did you sprinkle some regular sugar or brown sugar on top before baking? Bread looks super moist and incredibme awesome. What is Maida and what is curd? I was so happy to see your recipe since my grandson is allergic to eggs and so has never been able to enjoy banana bread. I plan to make it as soon as I find out what those 2 ingredients are. Please let me know Nitya can I make this bread in LG convection Microwave? Use the convection mode to bake it. It will work fine. 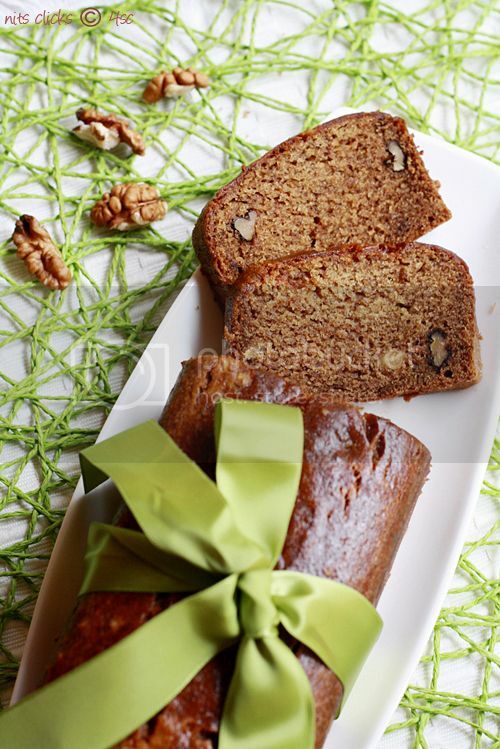 The perfect banana bread i've ever come across!! 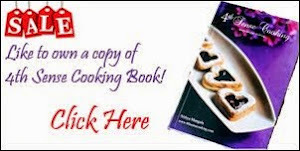 Nithya, I tried it and was a superhit at home. Baked it only for 38-40 mins as the top started to develop cracks. Thanks for the wonderful recipe..